What makes American Made Pine Furniture so appealing? More economical than say, cherry wood, pine furniture is charming, warm and affordable. Eastern White Pine is a straight-grained wood with a fine, uniform texture and displays paints and varnishes very well. Our Amish 3 Tier Pine Open Bookshelf brings a useful companion to your cottage style living room, den, office or bedroom. 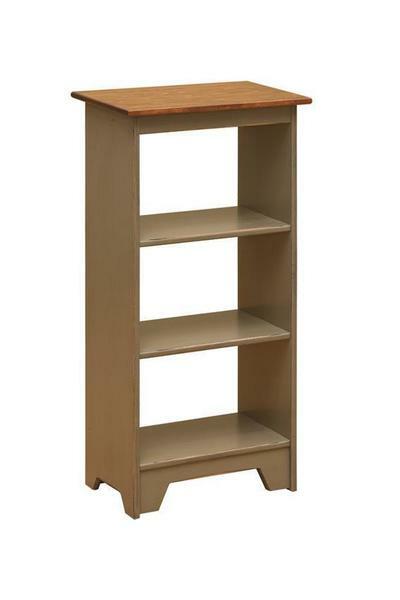 With three shelves to hold books, magazines, phones, family photos and your prized lamp, this handy bookcase is handcrafted to serve. Just the right size to hold a collection of favorite fairy tales, this is just right for a children's collection of books! A softer wood, Pine Furniture includes knots and natural blemishes that add to the authenticity of this bookshelf. All of our American home furniture is built to function for you and your family for years to come.